Not so long ago I came across this discussion on linkedin about a value stream mapping simulation. The author of the thread, Silviu Trebuian, had developed two such VSM simulations and was offering them to the group for free. Naturally, I took him up on his offer. . . along with 500 other people! Silviu's value stream mapping simulation is a computer-based activity. 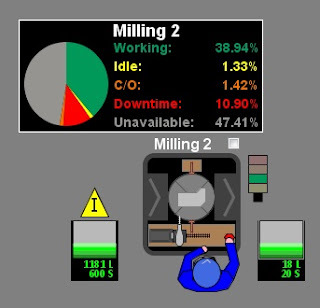 Similar to the Lean Bicycle Factory, this one shows a graphical representation of a manufacturing facility. There are several departments: cutting, milling, and lathe. Note: This simulation is no longer available at the links given...Good things never last. 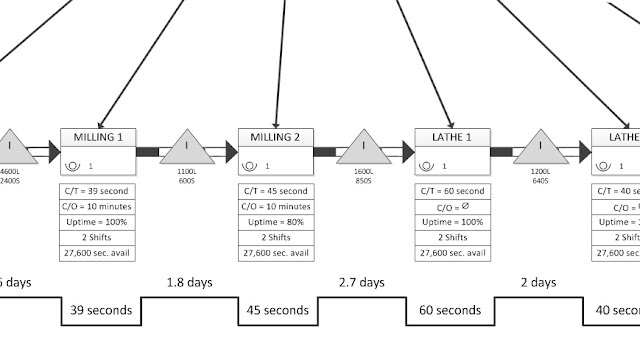 Each process has a defined cycle time, but they're not all the same! And since the work cells are interlinked, inventory builds up in between each one. The screen shot above doesn't really do it justice. Once you see it running for yourself, you will love the slick movement of each little machine. You can watch the simulation run for days. Inventory builds up and and is graphically represented by a little bar before and after each station. The beautiful thing about this simulation is that everything is adjustable! All process parameters can be changed. 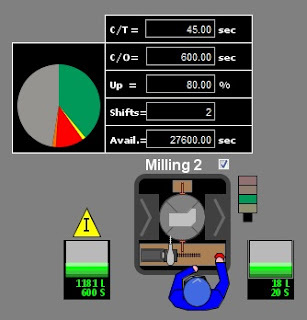 You can change the cycle time, the changeover time, up time percentage, how many shifts run and the total available time, for each station. This is where the simulation shines and you can lose yourself in it for hours. By making the first stations go fast and the last one go slow, you get a ton of inventory in the middle. Or you can make the last station go fast and be waiting for parts. You can add customer orders or take them away. You can speed it up or slow it down. You could even watch it in real-time. There goes a week, just like that! So what use is this simulation, other than to mesmerize yourself? 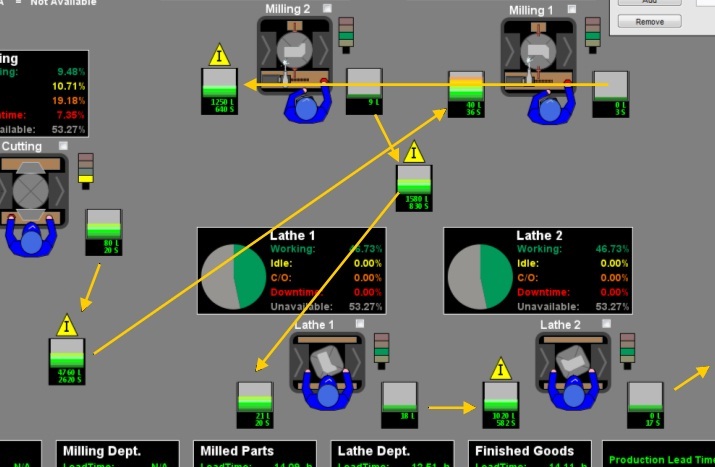 This value stream mapping simulation is perfect for value stream mapping training. 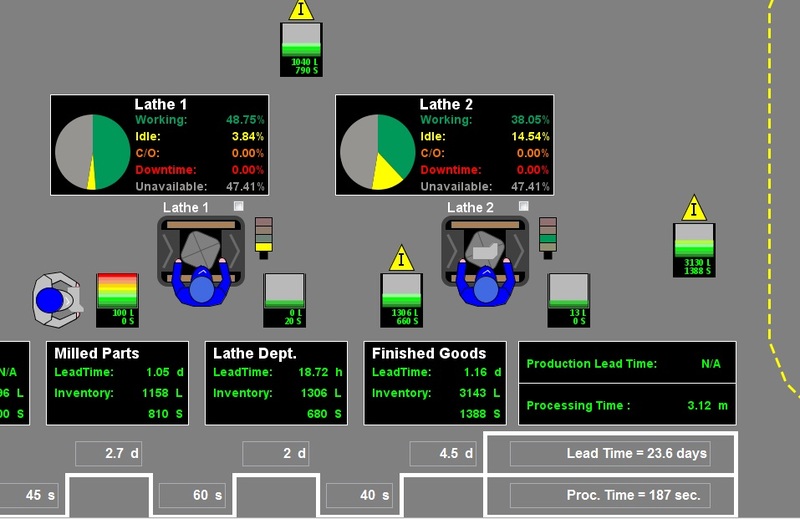 By putting it up on a big screen, you can show the different stations, how the process flows, and where inventory builds up. You can enter parameters based on your group's discussion.
. . . it also gives you a full-fledged Value Stream Map to go along with the simulation. Here's where you can use it for training. All the critical information is outlined for each process in the value stream map. You can flip back and forth between the simulation and the VSM to see each process running. If you are unfamiliar with value stream mapping, check out this value stream mapping video and my post full of value stream map examples. Now be forewarned. There's a lot going on in this simulation and it's hard to follow the flow at first. Inventory is tracked with those green bars, but disappears from one station to reappear at the next. But since they are not in logical order (what current state is?! ), it can be a challenge to understand how the product is flowing. Since this is a value stream map simulation, one could just follow the value stream map. So, after watching the simulation for an hour, trying to wrap my head around the flow, I decided to refer to the value stream map, which clarified the process flow. Still, I was having trouble seeing it, particularly where the inventory was stored between cells and in the supermarkets. A little confusing, like most production plants! After watching this for awhile, I made this little diagram to help me out, since inventory appears and disappears pretty fast. Note that material handlers are moving batches of 20 at a time. If you decide to work with this simulation, I hope this little diagram will help. Look at this messy flow! Where can you get your hands on this simulation? You could do what I did and post in the linkedin thread. Silviu will send you a zipped file with everything you need to run this simulation on your own computer. Or you can venture over to simando.com, where you can find a web-based version of the simulation. To be honest, I am a little wary about installing software on my machine, so I only tried the web-based version. It was more than sufficient and ran without any lagging. If want to run it without being tied to the Internet, you might want to install the software. If you decide to give this a spin, please come back and tell me what you think. Is it useful for training or a little too cumbersome? What do you think? I've added this Value Stream Mapping Simulation to my monster list of free lean games and simulations. This seems pretty neat, and clearly someone put together some innovative efforts to pull this off. However, it some ways it still packages information for the user. The "paper case method" of teaching value stream mapping is like this. It gives you a whole bunch of data. It often organizes it for you. And then you convert it into a map. This assumes that the primary skill required is building a map. However, it isn't. When we teach value stream mapping, first, we call it value stream improvement. That is because the purpose is improvement and not mapping. 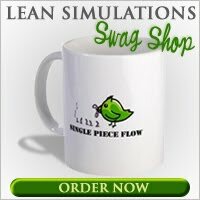 Second, we use a simulation called LeanQuad specifically built for this situation. We teach the participants relatively little about value stream mapping, except to be crystal-clear about it's objective. Then we let them start mapping. We choose this approach for two reasons. First, they struggle in a safe environment, instead of having it easy in a safe environment and then struggle when it counts. Second, the key skill isn't mapping, it's being able to draw out the critical observations to gain insight and knowledge about how to drive improvement forward. The map itself is just a mechanism to facilitate that dialogue and understanding. I share this not to discount the example shared, because I think it's great that this was done, but to instead share some perspective on what teaching value stream improvement should be all about, and also how we should ensure we understand the critical learning objectives before designing or selecting the appropriate simulation. I totally agree that when teaching value stream mapping we should focus on the objective. I like your term "value stream improvement." I'll have to use that one. I've participated in several VSM training sessions where the focus was on the mapping aspect and it was a little hazy what we were going to do with the map afterward. Thanks for putting it in perspective. I love this Value stream mapping simulation tool as we are preparing one VSM workshop to the team, we just use the material from "Learning to See" by LEI, which looks that this tool should be better than just slides. I tried to download it or go the webbased version per the link above, but failed. Would you pls offer me that one? Thanks! It looks like you are correct. The website is dead and the Linkedin discussion has disappeared, as well. You could try to contact Silviu Trebuian directly on LinkedIn above. I do not have the simulation anymore myself. Thanks for commenting and letting me know about the links.